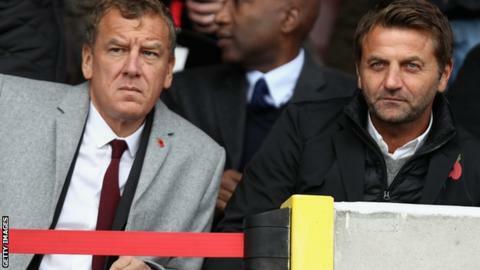 Swindon Town's new manager will have 100 per cent responsibility for player recruitment, chairman Lee Power has told BBC Wiltshire. The Robins, who were relegated to League Two in their penultimate game of the season, parted company with head coach Luke Williams on 5 May. In the past, Power has often been heavily involved in transfers himself. Power also tried a director of football model, appointing his friend Tim Sherwood to that position in November. But the former Tottenham boss has taken a step back from the role in recent times, after Swindon won only seven of their 31 games since his arrival. Following Williams' departure, Power has revealed there will be a change in the club's structure, with a new manager given a budget to control. They hope to make an appointment within the next eight days. Partick Thistle boss Alan Archibald has been linked with the vacancy at the County Ground, along with Mansfield's Steve Evans and former Queens Park Rangers boss Jimmy Floyd Hasselbaink.